This artist's conception shows the giant impact that created Earth's moon. New research suggests the impact was powerful enough to vaporize a large portion of the young Earth. The massive collision that created the moon may have vaporized most of the early Earth, according to a new analysis of samples collected during the Apollo moon missions. In the early days of planet formation, a grazing collision between the newborn Earth and a Mars-size rock named Theia (named after the mother of the moon in Greek myth) may have led to the birth of the moon, according to a prevailing hypothesis. Debris from the impact later coalesced into the moon. The moon is Earth's nearest neighbor, but its origins date back to a violent birth billions of years ago. See how the moon was made in this Space.com infographic. In 2001, scientists began discovering that terrestrial and lunar rocks had a lot in common: the two bodies possess many of the same chemical isotopes. (Isotopes of an element have different numbers of neutrons from each other. These subvarieties are identified by different numbers; for example, potassium-39 or potassium-40). Isotopes can act as geologic fingerprints, because prior work has suggested that planetary bodies that formed in different parts of the solar system generally have different isotopic compositions. These discoveries threw the giant-impact hypothesis into crisis because previous computer simulations of the collision predicted that 60 to 80 percent of the material that coalesced into the moon came from Theia rather than Earth. The likelihood that Theia happened to have virtually the same isotopic composition as Earth seemed extremely unlikely. At first, scientists thought more precise isotopic analyses might help resolve this "isotopic crisis." However, more accurate measurements of oxygen isotopes reported in 2016 only helped confirm this problem, said study lead author Kun Wang, a geochemist now at Washington University in St. Louis. "Now we need to rethink the ideas that we had about the giant impact," Wang told Space.com. New models of the giant impact seek to explain how the moon could have formed from mostly the same material that makes up the Earth, rather than mostly from Theia. A diagram showing two recent models for how the moon formed from a collision between the early Earth and another massive body. One model (top) allows for an exchange of material between the Earth and the moon through a silicate atmosphere, while the other model creates a more thoroughly mixed sphere of a supercritical fluid (bottom). Each of these models leads to a different prediction for potassium isotope ratios in lunar and terrestrial rocks (right). The original giant-impact model suggested that a relatively low-energy collision melted part of Earth and the whole of Theia, flinging some of the molten debris outward. One relatively new model, proposed in 2007, starts with a low-energy impact just like the original model, but adds an atmosphere of silicate vapor around Earth and the disk of debris that ends up forming the moon. This model suggests that this vapor shroud helps Earth and the disk exchange material before the moon emerges from the debris. One drawback of this low-energy impact model is that it would take a long time to exchange material through an atmosphere, Wang said. This scenario would make it difficult to achieve the mix of material seen in terrestrial and lunar rocks, he said. 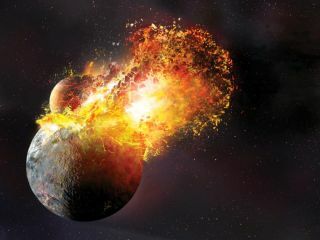 Another model, proposed in 2015, suggests that a high-energy impact created the moon, one so violent that it vaporized Theia as well as most of Earth, including the young planet's mantle region (the layer just above the core). This dense vapor then formed an atmosphere that filled a space more than 500 times bigger than today's Earth. Much of this material would fall back onto the Earth as it cooled, but in addition, some of the debris formed the moon. In this high-energy model, the atmosphere would behave like a "supercritical fluid," without a distinct separation between liquids and gases. Material could mix thoroughly in such an atmosphere, which could help explain the identical isotopic compositions of Earth and the moon, Wang said. To see which model might best explain how the moon formed, Wang and his colleague Stein Jacobsen at Harvard University focused on potassium isotope data from terrestrial rocks and lunar samples gathered during the Apollo missions. Potassium is volatile, or easy to evaporate, and previous research suggested that analyzing potassium isotopes could shed light on the conditions during the event that formed the moon. The scientists analyzed seven moon rocks collected during the Apollo 11, 12, 14 and 16 missions. They compared their potassium isotope ratios with those of eight rocks representative of Earth's mantle. The researchers developed a method to analyze potassium isotopes with a level of precision 10 times better than the best previous technique. Potassium has three stable isotopes, but only two of them, potassium-39 and potassium-41, are abundant enough to be measured with sufficient precision for this research. The scientists discovered that lunar rocks were richer by about 0.4 parts per thousand compared with Earth rocks when it came to potassium-41, the heavier stable isotope of potassium. These findings support the high-energy impact model, which predicted that lunar rocks would possess more of the heavier isotope than terrestrial rocks. In contrast, the low-energy impact model suggested that lunar rocks would contain less of the heavier isotope. The best explanation for how the heavier isotope came to dominate was that the moon condensed in a cloud with a pressure of more than 10 bar, or about 10 times the atmospheric pressure on Earth at sea level. "I'm kind of surprised that the new model fits the data the best," Wang said. Still, "we had no expectation which model we were going to support," he said. Future research should conduct follow-up studies to test these new findings. "We're definitely hoping more people will follow up and try to confirm our results," Wang said. Wang and Jacobsen detailed their findings online Sept. 12 in the journal Nature.